Preheat the oven to 150°C, gas mark 2. Finely chop the figs and mix in a bowl with the orange zest, juice and ginger – do this with your hand as it's the best way to make sure the flavours are evenly distributed. Lightly grease a large baking sheet. Beat together the butter, icing sugar and vanilla, until pale and creamy. Beat in the egg yolk, then the flour. Turn out onto the work surface and knead to make a smooth dough. Roll out to a 35 x 22cm rectangle and cut lengthways into 3 strips. 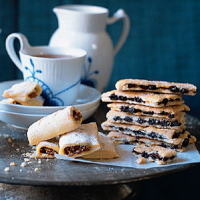 Using your fingers, press the fig mixture down the centre of each strip, keeping it in a compact line. Fold the dough over the filling, rather like making sausage rolls. Mould into a log shape, squeezing out any cracks, and cut each log into 8 lengths so you have 24 fig rolls in total. Place on the baking sheet, spacing them slightly apart, and score the tops with a knife. Bake for 30-35 minutes until pale golden. Transfer to a wire rack to cool. Serve dusted with icing sugar. Fresh ginger and orange give a fresh, zesty flavour to the filling. If you prefer, add a tsp of ground mixed spice instead of the ginger, or leave the spice out altogether.